According to Comcast, customers who do not opt out of the Arbitration Notice within 30 days of receiving the notice will relinquish their right to pursue any legal remedies against Comcast in court, including claims for negligence, fraud or intentional wrongdoing. Nor can they join together as a class to seek common remedies. Comcast also attempts to limit the time in which subscribers can file a claim for injuries to one year and an even shorter time for billing disputes. On line: Go to www.comcast.com/arbitrationoptout and fill out the form. You will need a copy of your Comcast bill so that you can enter your entire customer account number as it appears on the bill. If you have any difficulties, call 1-800-COMCAST (1-800-266-2278) and report the problem. You should keep a copy of the form. By Mail: Write a note to Comcast which includes your name, address, Comcast account number, and a statement that you do not wish to resolve disputes with Comcast through arbitration, and then mail to: Comcast, 1500 Market Street, Philadelphia, PA 19102, ATTN: Legal Department/Arbitration. You should also keep a copy of the letter you send to Comcast. Comcast subscribers who have any problems or concerns should contact the County Office of Cable and Communications Services at 240-773-2288. I can't say I'm surprised by Comcast's actions. If the company serves other County residents as poorly as they did myself before I dumped their awful company, it's no wonder they want to limit their liability. MPW plans to continue its summer hiatus for another 10 days or so. Hope everyone is enjoying the great summer weather. Maryland Lieutenant Governor Anthony Brown will appear on the "Political Pulse" TV Show on Thursday, July 19th at 9:00 p.m. and Tuesday, July 24th at 9:30 p.m. Issues that will be discussed include (1) the structural state budget deficit and its effect on Montgomery County; and (2) the effect of the Base Realignment and Closure (BRAC) on Maryland and Montgomery County. Lieutenant Governor Brown is the Chair of the Committee which includes Cabinet members and others that is overseeing BRAC efforts in Maryland. Read on the Washington Post opinion page today why I oppose the proposed interstate compact to reform the Electoral College. -Whether tunneling is possible or feasible for parts of the planned Purple Line route. 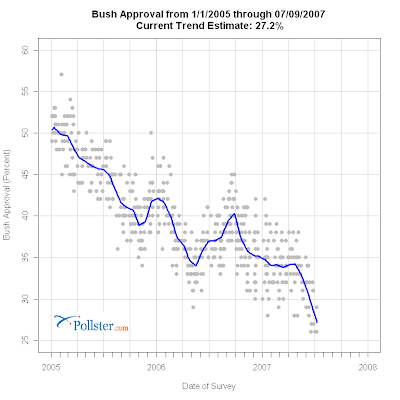 According to pollster.com, Bush's approval rating is now at 27% due to a steady plunge over the past two months. This is not the result of a single polls. Their measure is an estimate which they constantly update based on the latest polls. In the above graph, the line is the trend estimate and the grey dots are the individual polls. The yowls that went up from the land at Governor O'Malley's relatively minor cuts of $213 million will make slots all the more appealing when the Governor and the General Assembly finally hit the coal face of trying to eliminate the remaining deficit of approximately $1.3 billion. Slots is probably the only one of the many options for raising revenue (outlined in a previous post: Let's Get Fiscal) where people will volunteer to give away their money. If we go in big for slots (15,500 machines in 7 locations), it will close most of the budget deficit by bringing in $16.5 million in FY 2009, $412.6 million in FY 2010, and $807.4 million in FY 2011. The bang will be less big if the State is less cautious and goes with a mere 9,500 machines in four locations: $1.1 million in FY2009, $109.7 million in FY 2010, and $337.3 million in FY 2011. It doesn't take an accountant to figure out that money from slots reduces the pressure on the Guv and the Leg to raise taxes. They will likely be relieved because Ehrlich already raised many "fees" as they were called by Republicans back in the day (read: before he lost the election). Many of the most-discussed tax choices will fall heavily on MoCo. Remember that soaking the rich in Maryland means soaking us in Montgomery even if a dollar goes a lot less further here than in much of the rest of the State. It also makes it easier for County Executive Ike Leggett to raise revenue locally which will stay here to address many local problems. The State may even have the funds to spend on interests near and dear to our wallets, like making sure that teacher retirement (a very big-ticket item) stays fully funded and perhaps the GCEI (Geographic Cost of education Index). If Gov. O'Malley is smart, he'll link any slots plan directly to a new major spending proposal with broad popularity, such as a Maryland equivalent to the Hope Scholarship program in Georgia. Maryland is an oddly-shaped state (geographically challenged?) with many neighbors who already have slots. West Virginia has slots and the track--I can still hum the Charles Town Races and Slots jingle from having heard it so many times--and our western neighbor appears ready to make the jump into casino table games. Many Marylanders ride the bus to play slots or bet on the horses in Delaware. Pennsylvania opened its first slots parlor last year; it already had horse racing. Slots proponents argue that we ought to keep the money that Marylanders spend gambling there here at home. Our younger readers may be surprised to learn that Maryland was once Louisiana on the Potomac--only without the fine Cajun cuisine or French-speaking politicians. It is still in living memory that Maryland's entire political class was arrested for corruption starting with Vice President Spiro Agnew and continuing on through Democratic Gov. Marvin Mandel and far, far down the political food chain. Alcoholics on the wagon should be commended for fighting the good fight and a tough struggle every single day--but they also shouldn't open bars. Even if Tony Soprano doesn't personally drive down the Garden State to start handing out checks in Annapolis, legal gambling syndicates will have so much money to throw around that their influence on our state's politics will be profound. A license to run slot machines is license to print money, so don't be fooled into thinking that they won't have lots of it. And a little money goes a long way in most state capitals. As one Arizonan said after much of his state legislature was arrested in a major corruption scandal: "I knew they could be bought but had no idea how cheaply." Buying Congress is expensive because of federal campaign laws and the expense of congressional campaigns makes it prohibitive. Not so at the state level. There is a potential solution around this problem, though it will require saying no to the interests who have spent much money promoting slots in the state: the government should run the machines. I cannot fathom why Maryland should essentially enrich a narrow class of oligarchs by handing over lucrative licenses. Let's do it ourselves and keep all the money if we are going to do it. Don't worry; they'll still be plenty of corruption to resist in all of the state contracts to build, run, and maintain the new acres of machines. For some reason, gambling is yet another of the many activities with huge class connotations. People lower on the financial food chain who gamble play slots while the affluent favor table games and James Bond plays baccarat (no, not the crystal). As Tom Schaller has argued (I can't seem to find the link), if we're going to have gambling, we might as well go the whole hog and gig everyone. Gambling is an addiction that has ruined many people. Like alcohol, it doesn't snare most people but it hits some people very hard. And it is a temptation that is easier to resist if it isn't just next door. Proponents say that people who like slots can already play in neighboring states but it is a lot more tempting when it is nearby. I recall an interesting story in the paper about how a mayor who brought gambling to her town then had to watch her sister gamble away her house and fall into ruin. Unsurprisingly, like many addictions which require regular infusions of large sums of cash, it is associated with a rise in crime. Lots of reasons for this one. First, the social problems mentioned above cost money. People who lose their shirts and jobs to gambling addiction don't pay taxes. Instead, the State ends up having to pay to fight rising crime and other associated social ills. Second, much of the money goes out of state. We don't make slot machines in Maryland. All of the money for slots infrastructure will benefit Nevada, not Maryland. Many owners may take and invest their profits elsewhere as well. Maybe I just didn't grow up with the fresh smell of horse dung but this has to be the least appealing reason for bringing slots to the State. It's not politically correct to say in Maryland, especially around Baltimore, but the horse racing industry does not strike me as an especially valiant goal worthy of taxpayer subsidy. It is bizarre enough that the federal government pays corporations large sums of money to grow food in the breadbasket of the world. Must we extend bad policy into lunacy? And the Delaware experience shows that slots, not the horses, is the total focus of any slots and racing parlor. Racing may "survive" but only because it permits people to operate slot machines. Oh, and needless to say, this is a complete dog of a political excuse for voting for slots in Montgomery. Though I imagine my reader(s) in Laurel may disagree, Pimlico should avoid a shotgun marriage with slots. I hesitated to put this one down because I don't demand that the State be in the morality business. Indeed, I prefer it stay out of it. Even if the State already runs the lottery and, here in Montgomery, peddles alcohol (albeit with the supposed goal of curtailing the negative effects of its use), do we really want to encourage the belief that one can get something for nothing? That the good life doesn't take hard work but a lucky spin of the wheel? So are you ready to pull the lever? 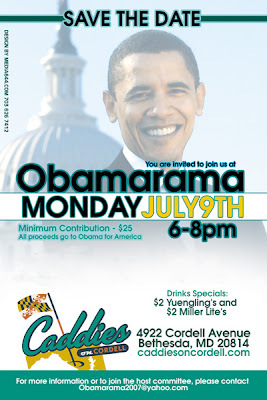 See this no-punches-pulled post by MoCoPolitics on the Montgomery's delegation in the Maryland Senate. The question of how to fund the multibillion-dollar Purple Line is taking on greater significance as numerous studies move forward examining the precise route of a potential Metro line connecting Montgomery and Prince George’s counties. The ICC was conceived decades ago and, like the Purple Line, is hoped to be a congestion reliever for the Capital Beltway. Once completed, the ICC will be an 18-mile toll road linking Interstate 270 in Gaithersburg with I-95 in Laurel. Leggett told The Examiner that he considers both pursuits critical, as they are part of Montgomery’s Master Plan for development. Yet paying for both is not as simple as seeing the merits in a road and rail project. At this point, each project is set on a very different time track. ICC construction began in October on the first of the roadway’s five phases. But potential state funding for the Purple Line was delayed by a year when Gov. Martin O’Malley earlier this year announced plans to do a more accurate ridership study. Leggett and members of the transportation-supporting group Action Committee for Transit said the extra time could ultimately help secure funding. Still, selling state and federal leaders on expensive pursuits for one area is no easy feat. “There’s that question of, ‘Are we going to do two thing for Prince George’s and Montgomery?’ ” said John Carroll, who noted that his Action Committee for Transit will continue to push for progress on the Purple Line. Meanwhile, county residents have only until the end of the week to apply to be on the County's Purple Line Advisory Committee. If you want to date yourself, you can always talk about how you remember when Lowen's toy store and Gifford's Ice Cream were located on Wisconsin Ave. and you could even drive straight across Wisconsin Ave. on Old Georgetown Road. It wasn't quite Mayberry but it was quite different from the urban environment which has grown up around the Metro stop. I've been following new development in Bethesda for the Town of Chevy Chase's Long Range Planning Committee . Lots of new projects are on the books that will promote an even greater transformation of the core of Bethesda. Indeed, 15 new projects have already been announced. In this post, I detail two of the largest projects. Both will have a major impact on existing connections between Bethesda and Chevy Chase. Two huge development projects are planned for the intersection of Woodmont Ave. and Bethesda Ave. Woodmont East II will be an enormous development. It will engulf the existing building where Thyme Square is located as well as the open space between that building and the Bethesda Row Landmark movie theaters and even go over the existing garage in the adjoining building. In addition to a new 121,090 square foot hotel, Woodmont East II will contain 250 new condominium units in 304,135 square feet. There will also be 78,300 square feet of office space and 36,300 square feet of retail space. This building will have to over the existing trail and the tunnel under Wisconsin Ave. connecting Bethesda and Chevy Chase will be blocked during construction. Hikers and bikers will have to cross Wisconsin Ave. and go through Elm Street Park during construction. Although the County spent substantial funds during the Duncan years to open the tunnel, the Department of Planning is not bothered by the change as the Master Plan apparently has the trail connection going down a non-existent bike lane along this route. Lot 31 is already becoming the Area 51 of Montgomery County. This enormous development is a public/private partnership between Montgomery County and PN Hoffman and Stonebridge Associates. It will encompass the existing Lot 31 and 31A parking lots opposite Barnes and Noble and even Woodmont Ave. between them. You can view the development plan for yourself on their website designed to promote the project. The development plan includes the construction of an underground parking lot with 1450 parking spaces (1150 public and 300 private). The parking lots will have two exits, one on the east side of Woodmont Ave. and one on Bethesda Ave (east of Woodmont Ave.). There will be 250 condominium units ranging in size from 600 to 3500 square feet for a total of 332,500 square feet. Thirty workforce housing units are included in the project. There will also be 40,000 square feet of retail space at street level. The development plan should make the pedestrian crossings at Bethesda Ave. and Woodmont Ave. narrower and easier to cross than the current intersection. The plans also include a bike drop location and enhanced access to the trail behind the building, roughly equivalent tothe current secondary access behind the parking meters on the lot. Construction of the parking lot will entail closing Woodmont Ave.between Bethesda Ave. and Miller Ave (the latter is just north of Leland St.) for an estimated two-year period between Summer/Fall 2008 and Summer/Fall 2010. There will also be permanent changes to the traffic pattern which will greatly impact the Town. Specifically, a new median will be constructed which will make it impossible to make left turns from Woodmont Ave. on to Leland St. This change appears designed primarily to assuage the community on Leland St. which will have to endure years of construction. Woodmont Ave. will also be narrowed from two lanes in both directions to one lane, thus likely increasing traffic backups on this street, especially in Ourisman Honda continues to unload cars there as it does now. I always think of Federal Realty in terms of Bethesda Row and Rockville Town Square. However, they own the shopping center in Cleveland Park as well. The Examiner recently covered how local residents torpedoed their efforts to recruit a new Cosi to that locale in an article titled "Struggle over Cleveland Park's Soul". Here is a roundup of the projects currently under construction (or about to start construction) in the Bethesda Central Business District. Federal Realty is constructing a mixed housing and retail complex on the east side of Arlington Rd. between Bethesda Ave. and Elm St. where Giant Food used to be located. The new building will contain 180 "luxury" apartments as well as retail establishments on the ground floor (207,340 square feet of housing and 67,651 square feet of retail). This mixed residential-retail building is located on Wisconsin Ave. practically on top of Staples. Approved at the height of the Bethesda housing frenzy, the Adagio will contain 92 residential units (150,660 square feet of housing) priced at $650,000 to $1.6 million. Washington Sports Club is the major retail anchor (44,146 square feet of retail). After much delay, WSC has finally announced to its members that its club at Bethesda Ave. and Woodmont Ave. will close in September and be relocated to the Adagio. However, no information has be issued about the parking situation. Another mixed residential and retail development, Liongate is located at the intersection of Old Georgetown Rd. and Woodmont Ave. (also known as Woodmont Corner where Olsson's, Flanagan's and Outback were located before the cranes went up). This twelve floor building will have 158 "luxury condominiums" (in 267,516 square feet) as well as retail on the ground floor (in 17,000 square feet). Located in the Woodmont Triangle, Trillium is at the leading edge of an expected spate of new development in this section of Bethesda since the adopted of the Woodmont Triangle Amendment to the Master Plan for the Bethesda Central Business District. Located on Battery La. between Wisconsin Ave. and Woodmont Ave., this nine-story building is being constructed by the Patrinely Group. It will contain 198 new residential units (in 260,662 square feet) as well as retail space (in 16,595 square feet). A new 216-room Hilton Garden Inn is being constructed as part of the Air Rights Center. However, the hotel will only compose 132,421 square feet of this development--office space will comprise 364,100 square feet in the building with retail comprising the remaining 4,600 square feet. Located just north of Elm Street Park, Chevy Chase Councilman Mier Wolf informs me that the developers have agreed to stage the construction from Waverly Ave. rather than the park and to pay for improvements to the park. Located on the same block as Ben & Jerry's, this relatively small mixed residential-retail-office development will contain just two residential units in 2,626 square feet as well as 1,092 square feet of retail space and 1,490 square feet of office space. In upcoming posts, I hope to detail the many pending and future projects which are at various stages of planning approval process. Takoma Park is hosting its annual Fourth of July celebrations which include both a parade and fireworks. The parade goes down Maple Ave. and the fireworks take place at Takoma Park Middle School. Sen. Jamie Raskin sent out an email reminding friends and supporters of these events and his district headlined by the epigram " “A patriot must always be ready to defend his country against his government.” A very American sentiment though I wonder if Jamie realizes that he is now part of the government! The Town of Chevy Chase will be hosting its annual picnic for town residents at Rosemary Elementary. The celebration starts off with the traditional kids parade at noon. Kensington is also hosting a children's bike parade at 9:45am. Donna Edwards, who lost to Congressman Albert Wynn (Fourth District of Maryland) by a small margin in the 2006 Democratic primary, will be on the "Political Pulse" TV Show on Tuesday, July 3rd (at 9:30 p.m.), Thursday, July 5th (at 9:00 p.m.) and Tuesday, July 10th at 9:30 p.m.
Donna Edwards has announced that she is running again against Congressman Wynn and that race will probably be the most contested primary of all the Maryland Congressional races in 2008. About one third of the Fourth Congressional District is in Montgomery County. I am asking for your help on a very important issue. As many of you may know, in May the County Council passed a measure to extend the parking meter hours in the Bethesda, Silver Spring, and Wheaton parking districts. This measure takes effect today and extends the hours from 6pm to 10pm. For a more complete description of the changes, please view a recent Gazette article. The reason that the change was proposed was because the Wheaton and Silver Spring Urban Districts currently do not generate enough revenue to cover their costs. However, many business owners are concerned that these changes will discourage customers from patronizing their establishments in the evening hours. particularly important for the viability of our many small, locally owned, independent restaurants. I am asking that you show your support for them by emailing or calling the County Council to tell them that you want the measure to extend parking hours repealed. Our window of opportunity for action is small. The Council must hear from us by close of business on Tuesday, July 3rd. . . .